I am writing this to inform everyone officially that I will be stepping down as the active President of the Maverick Volleyball Club for the coming year. I have made a bold decision to leave my job, my city and my comfort zone to try things out at the next level. Since Aug 19th I have been serving as the Head Coach of the RMC Palladins women's volleyball team in Kingston. The decision was both a difficult one and a liberating one. After 29 years with the club and 30 years teaching at the same school I was inspired by the excitement of our players moving to the next level and succeeding so well, it would serve as a catalyst for me to try and do the same. Every coach wants to try and succeed while being challenged. I enter this season with a new team, in a new league and a new training environment. All of those things that keep us young at heart. A chance to work with the very special athletes who choose to attend the Royal Military College of Canada is just what I was looking for. While the small population of the school makes the challenge even more daunting, the determination and grit these athletes are giving me on a daily basis makes my job a pleasure. I am also proud to know that some day they will be the future leaders in our Canadian Forces and in fact our nation. The Maverick Volleyball Club has become the crown jewel in my treasure chest of memories and accomplishments in volleyball. To have it flourish in a way I couldn't imagine just as my three children all chose to be a part of it, was additionally more rewarding. The support I have received from my wife, both in the past and once again while taking on this challenge, is so crucial to my success that I feel empowered just knowing she is again behind me 100%. For that I will be extremely thankful in good times and especially when times get tough. Leaving the club in the hands of the many people who have been instrumental in it's rise to National prominence was not a tough decision for me. It is my confidence in them that I wish to express to all of you that this will be yet another great chapter in the making. John Nguyen will take over operations of the competitive club while Greg Skotnicki will guide the Community programs. My two fellow board members have been more of the blocks that the club foundation is built on than most can know. Supporting John and Greg is an amazing cast of dedicated tireless workers who see the big picture and do whatever it takes to make things happen. The title of Members of the Executive is a shallow representation of what they do. John Spack, François St Denis, Bruce Dunning, Tammy St Denis, Pat Lacasse and Sally Spack have been the team of superheroes that all organizations need at their core. Joining them this season by special request of the Board is Sheila Roy and Denis Gaboury. 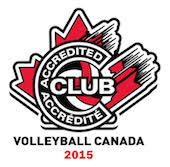 Both exceptional volleyball people and have strengths in areas that will help the club move forward. I know that my absence will be lessened due to the commitment of all these people. Chris and I will be back and forth to Ottawa fairly regularly and you may see us from time to time. My goal is to be involved on a level that helps keep things running smooth but is not in itself the driving force for any operation. As a new CIS coach who must recruit to survive, the women's teams and coaches will see me on a regular basis. I won't hide my pride in everything Maverick and will be sure to join you as you celebrate at the end of the season. I will always be reachable at the coordinates on the website so be sure to say hi once and a while and fill me in on what's happening.